The domain industry is technical, complex, and sometimes unforgiving. Part of what makes it unique is the multilevel channel involved in creating a domain from scratch to making it viewable on your browser. Unfortunately, the creation and distribution of domains are far from straightforward. They involve multiple parties, doing different things, in different ways, with different agendas. A change made by one party may profoundly impact the entire channel. It all starts with ICANN, the Internet Corporation for Assigned Names and Numbers. This not-for-profit entity is comprised of individuals from law enforcement, intellectual property law, government, and private businesses. ICANN coordinates the management of all technical elements of the Internet’s naming system. They also impose rules and regulations that ultimately affect the whole channel. A registry is an organization that creates and regulates domain extensions. Radix is an example of a registry. They own popular extensions like .WEBSITE and .TECH and they are the ones who create and enforce the requirements for these domains. 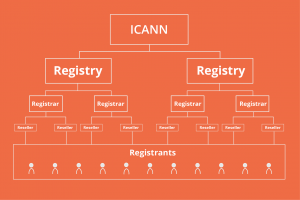 A registrar is an ICANN accredited organization (like us) that has the authority to issue domain licenses to registrants. Some supply domains directly to the public (retail), while others work with resellers (wholesale), who then facilitate sales to registrants. A reseller is a business that sells domains directly to registrants (end-users). Some focus on providing a straightforward experience for customers to purchase and manage domains. Others place an emphasis on additional services, such as hosting and website building. Registrants are people or businesses that own and register domain names. Think of it this way. The Government (ICANN) regulates the production, distribution, and quality of milk. Farmers (registries) need to raise cows to produce milk and supply it to distributors (registrars). The distributor then stocks the grocery stores (resellers) with milk, which is purchased and consumed by customers (registrants). Now that you have the basic concept, you’re probably wondering “why should I care?”. Well, simply put, a working knowledge of how the channel functions will help you make better decisions, and plan strategically. It will also help you understand why we make the decisions we make as a registrar. We know we’re not earning gold stars when we send a last minute email outlining unwelcomed changes that may alter your business processes. We’re not fans of it either, but the reality is that some changes are beyond our control. When they happen, we do our best to inform you well in advance, while implementing solutions that minimize their impact and ensure you are well prepared. For example, let’s say ICANN enforces a new domain expiration policy that changes how the expiring of domain names works. Maybe one consequence would be that when a domain expires, there is a short window where the public can bid for the expired domain. This change would trickle down to the channel, affecting each party. For registrars like us, adjustments to the expiration flow would need to be made to accommodate this change. For resellers, it would be important to make it explicit to customers that if they don’t renew in time, their beloved domain would be up for grabs to the highest bidder. Changes in the channel can be advantageous or disruptive. Wherever you fall in the channel, it’s critical to evaluate decisions, consider who they will impact, and prepare for the unknown. Sure the industry is complex, technical and sometimes unforgiving, but if it wasn’t, where would be the fun in that? We seem to only talk about account security in the aftermath of an attack or breach. It feels like the worst possible time to do so, as it’s reactive, and begs the question, “why weren’t these preventive efforts made earlier?”. Nothing bad has happened this time (we hope it will continue this way) but in the interest of being proactive, we’re here with a reminder of the features and best practices you can take advantage of to ensure your Enom account is as secure as it can be. Here are some ideas you can adopt today. If you don’t remember the last time you reset your password, take a moment to do so now. Two-factor authentication adds another layer of protection against unauthorized access to your account. With two-factor authentication enabled, a secondary method of identity verification, in addition to your password, is required to access your account. This comes in the form of a one-time security code, generated by a trusted app on your smartphone. It takes just a few minutes to download the app and enable the feature on your account. The best part? Setup is simple. So there you have it, three simple steps you can take to immediately boost the security of your Enom account, in just a few minutes. One final quick tip: you can apply many of these best practices to your other online accounts, including banking and social media. It’s an important first step in protecting yourself, and your company online.